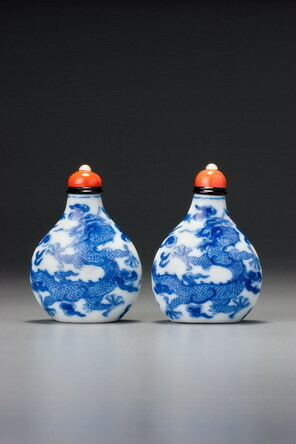 Production of sets or series of porcelain snuff bottles continued in the Daoguang period. Surviving examples on which the same design is seen over and over again, often with differences in composition, suggest that favoured designs were ordered in sets of ten, twenty, or possibly more. When supplies ran low, they were reordered. If surviving examples are anything to go by, the Daoguang reign saw no reduction in Imperial porcelain snuff-bottle production; it is possible that more were produced per annum during the Daoguang reign than either before or afterwards. Another from this set remains in the Imperial collection (Li Jiufang 2002, no. 333), and one is in the Franz Collection (Sin, Hui, and Kwong 1996, no. 88). With the compressed form of these bottles, We see classical construction in a two-part mould with vertical join and, in this case, unglazed interiors. There seems to have been a greater tendency in the mid-Qing to glaze the interiors of uncompressed forms than of compressed ones. By the Daoguang reign, however, most porcelain bottles (with the notable exception of the Wang Bingrong group, such as Sale 1, lot 112) had glazed interiors, so these are an exception. Whatever the root cause of this shift in fashion, it spanned the mid-Qing period; we can only suggest that the unglazed interiors here indicate a date from early in the reign. There is one last feature of this impressive pair that is worth mentioning, although they are not, strictly speaking a pair at all, but two of a series or set. 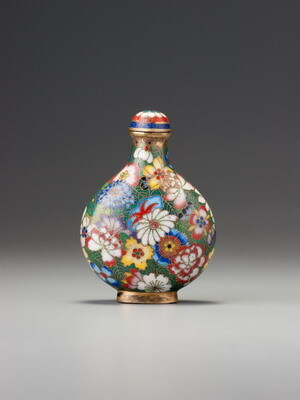 The control of the fine-line drawing is exceptional for bottles on a normal porcelain surface, as opposed to the special surface developed to control underglaze pigment. The massive production of underglaze snuff bottles of the mid-Qing period appears to have paid off in the refinement of the technology needed to control these volatile pigments when it mattered.